Looking for something to do with your kids during the half-term break? 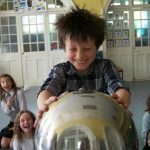 Look no further as we have 5 brilliant science activities that you can do at home- including indoor and outdoor fun! This activity can be carried out using simple household objects and is really fun and simple to do. All you will need is bowls/dishes (mixture of different sizes, a large tray, liquid water colours/food colouring, salt. Fill the bowls with water and leave to freeze overnight. Remove the ice from the bowls with some warm water and place onto a large tray (place try over a large towel/newspaper as it can get very messy). Get the children to sprinkle the salt over the ice- see if they can spot any changes to the ice. You will then need to use a pipette so that the colours can be added to the ice. The color is beautiful on its own, but the real reason for adding the liquid watercolors is to highlight the ravines, crevasses, and tunnels that are forming in the ice as the salt melts it. 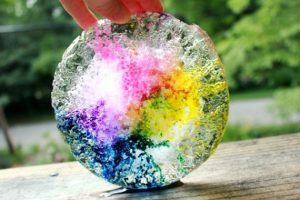 If it is a nice sunny day why not take your coloured ice outside to create sun catchers and you could also turn the ice over and add more colour to the other side. Also try different types of salt such as rock to see if it makes a difference. 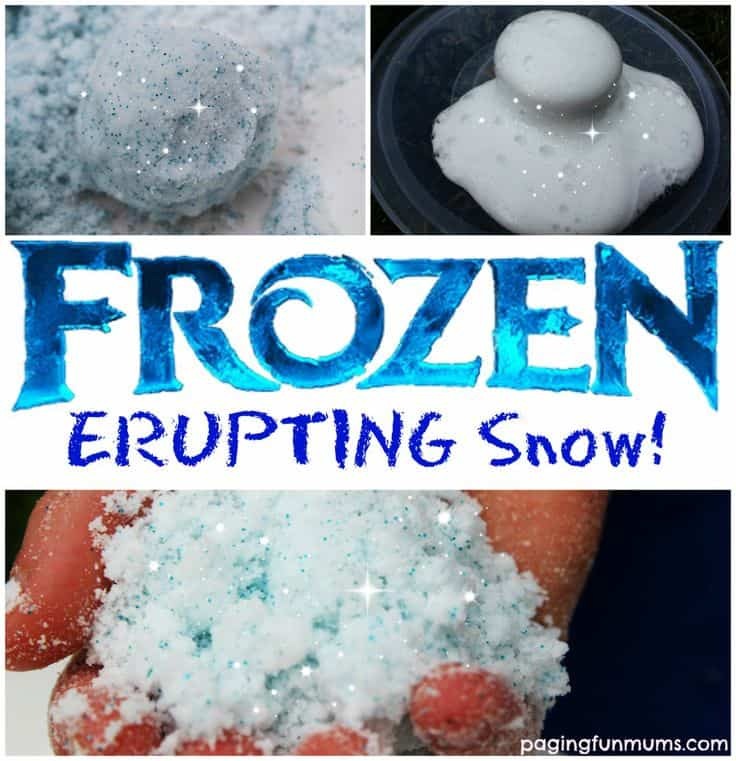 If you haven’t been lucky enough to get snow why not bring the magic indoors with this exciting experiment. All you will need is Borax, pipe cleaners (white or blue works best to act as the snow flake), string, empty jar and some pencils. 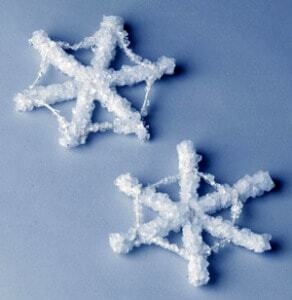 First of all the children will need to create their own unique snow flake any shape- get creative and have some fun. Then, connect a piece of string to the snow flake and place it into the jar. Connect the other piece of string to the pencil and suspend it from the jar. After the snowflakes are in position, put enough water to fill the jar into a pan of water and turn the heat to high PLEASE NOTE adult supervision will be needed. Once the water starts boiling, add 1 tbsp of Borax at a time until it is no longer dissolved in the water. You will then need to pour the solution into the jars. Leave the jars over night and wake up to a transformation. 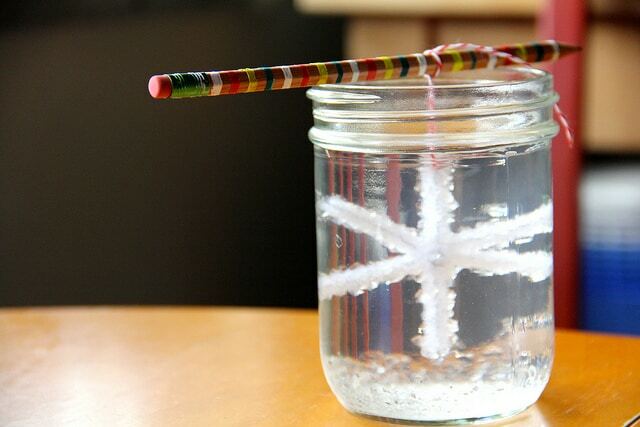 Remove the pencil from the jar and look closely to see what your children have created- a beautiful crystal snowflake. When you mixed the borax in with the water, you created a suspension. A suspension is a mixture that contains solid particles large enough to settle out. By mixing the borax into hot water, instead of room temperature or cold water, the borax stays suspended longer within the water. As the borax begins to settle out, or sediment, it begins to crystallize. You’ll see this crystallization on both the bottom of the jar and, you got it, on your snowflake. The borax continues to sediment on top of the snowflake and on top of other borax crystals until you pull it out of the water the next morning. For this activity you will need a jar, baby oil, white paint, water, glitter and Alka- Seltzer. First of all, fill the jar with 3/4 of baby oil. In a bowl mix together very warm water and white paint to make white water. The amount of paint you need will depend on how much water you are using with the idea being to use enough water so that you can fill the jar almost to the top. Once mixed pour the white water into the jar and then sprinkle in the glitter. Wait for the glitter and water to settle at the bottom of the jar. Once the water is settled it is time to make the snow storm! Take an Alka-Seltzer tablet and break it into pieces. Drop the pieces into the jar and watch what happens- a snow storm. If you are lucky enough to experience snow during half term why not try this unusual fun experiment. All you will need is some leftover snow, bicarbonate of soda, washing up liquid, red food colouring, vinegar and a water bottle. You will need to add all of the ingredients to the water bottle except the vinegar. Create a whole big enough to place the water bottle in the pile of snow, but so the children can not see the bottle. Add the vinegar and watch the eruption! If it doesn’t work so well, add a bit more washing up liquid and vinegar. A fun experiment that will keep the kids entertained indoors for hours! For this experiment you will need bicarbonate of soda, shaving foam, blue glitter and vinegar. Firstly, you will need to pour the bicarbonate of soda into a large mixing bowl. Then start to add the shaving foam until it feels as thick as snow. You will then need to add the glitter and give the mix a good stir. Your kids can play with this for hours and make different shapes or even people. The next part is the best part- time to start erupting! Pour the vinegar over the snow and watch the magic happen. It’s so easy to do over and over again too! 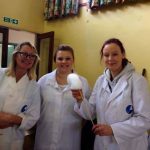 It’s also great fun to play with the foamy remains!